CORNWALL Athletic Club dominated the Magnificent 7 race at Saltash on Sunday. 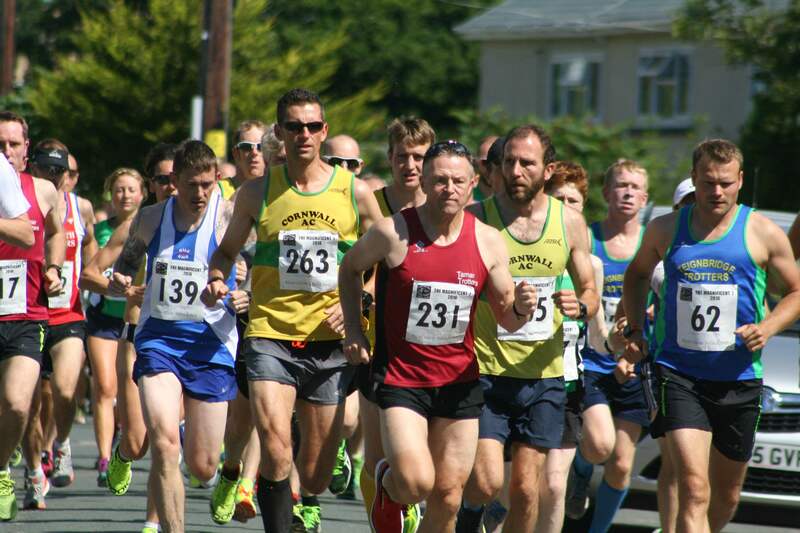 In hot conditions, the Carn Brea-based club had the first four runners home and the first female. Colin Snook retained the men’s title, coming home in 39 minutes and 47 seconds. That was slightly slowly than he had run in 2015 but the course had changed and the conditions were much tougher. His team-mates Justin Thomas (41.43), Paul Whear (41.56) and Paul Smith (42.37) were second, third and fourth, respectively. All four leading runners were veteran athletes. Hayle’s Daniel Costello was fifth in 42.39. Plymouth Harriers’ Steve Hill was seventh home in 44.04.
International veteran star Emma Stepto was 11th overall and first women home in 45.07 minutes. She holds the course record and has now won the women’s title seven times in the last eight years. St Austell’s Jessica Buscombe (50.06) was second women and Launceston’s Jeanette Johnson (51.14) third. Some 380 runners completed the course, described as ‘very hilly’ by organisers Tamar Trotters. There was also a one-and-a-half mile fun run that attracted a good turnout.